Donna's favorite stitch, it is slinky and fun! Good tension is a must. We love herringbone because it feels great, is fun to vary bead shapes and sizes, and you can increase with ease. 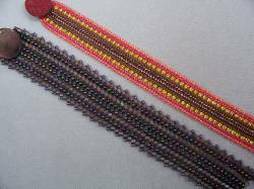 We can use virtually any seed beads you'd like: 8 cuts and 8/0s are great for beginners, Delica 10/0s or Delica 11/0s are lovely for those looking for finer work. Chris's favorite flat herringbone is the one with Delica 8/0s and 11/0 seeds; the texture is really cool! Using 4mm fire polished beads, two colors of Delica 10/0s, and 11/0 and 15/0 seed beads, learn to increase and decrease within the herringbone pattern. A student favorite! Oooo, how this undulates so wonderfully! Learn herringbone interrupted in the round! Chris created this fun pattern, herringbone in the round! Really fun new herringbone, created by our own designer, Donna! 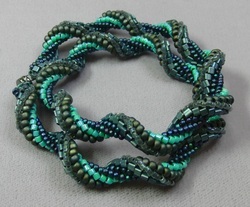 Simply using 2 colors of size 11/o seed beads, create this fun bracelet! 3mm Bugle Beads, 11/0 Delicas, and a determination to bead is all you need to create this fun design! So, they worked together and figured out this slinky pattern ... it feels SO GOOD! Learn flat herringbone stitch and create a wonderful striped pattern! This technique makes a great bangle. (Or you can add a clasp, there are no rules here!) Fun and easy, this is a great class to bring a friend! We use size 8/0 or 11/0 seeds that spiral around each other like lovers in Spring! When you spiral different sizes of beads, you get this really cool result! We use size 11/o Toho triangles with 8/os, 11/os, and sizes 10/o and 11/o Delicas in this class. 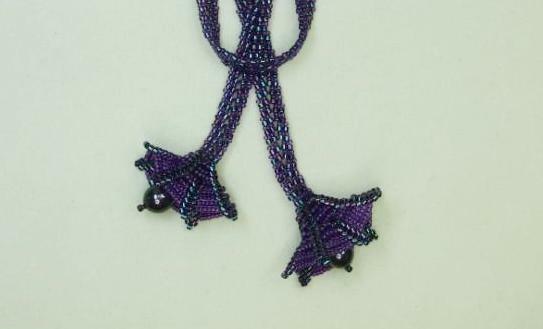 There are a lot of different effects you can get with this stitch, depending on the beads you choose. You can add beads between stitches to get baubles in your tube, you can embellish, or you can just make a simple, slinky tube! We use Delicas, Toho triangles or 2mm cubes, seed beads; really anything goes! 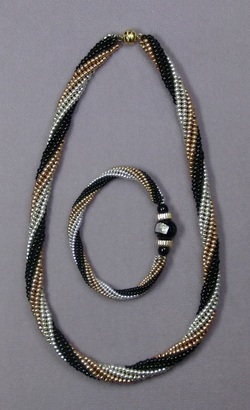 Using tubular herringbone with two sizes of beads makes this pattern flatten out and twist! We used 3mm fire polished beads and size 8/0 seed beads for this pattern. Pay attention to your tension in this one! Create this classically elegant necklace with a Swarovski focal and Delicas. Make this sweet chain with Delicas and 8/o seed beads.